From the Salisbury Prize to the Icabod Washburn Young Alumni Award to Fulbright Scholars, explore the many accolades and honors given to WPI students, faculty, and alumni from outside organizations as well as the university. Information on endowed professorships at WPI can be found here. Interested in a competitions coordinated by WPI's Collaborative for Entrepreneurship & Innovation (CEI)? Visit the CEI site to learn more and apply. 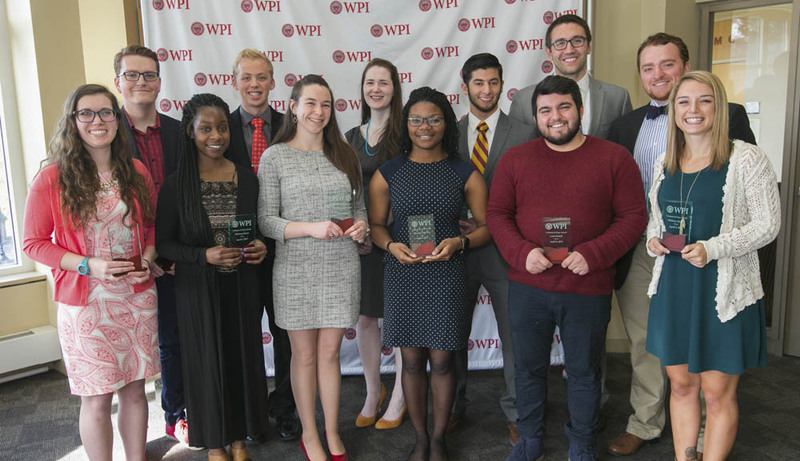 Nearly 50 students were recently honored at the Student Recognition Awards ceremony for their academic achievements and the work they do outside the classroom to enrich WPI and the surrounding community. Dean of undergraduate studies and mathematics professor Arthur Heinricher was also honored as Advisor of the Year for his work with Phi Kappa Theta. The President's IQP awards are given to student teams whose conception, performance, and presentation of their Interactive Qualifying Projects (IQPs) have been judged outstanding in focusing on the relationships among science, technology, and the needs of society. Congratulations to this year's winners. WPI's Innovator of the Year Award recognizes a graduate or friend of WPI who has demonstrated exemplary accomplishments as an innovator, showcasing individuals who have excelled in driving innovation within enterprises of all kinds.